Can I make misti doi at home in winter season too? Will the curd set in kolkata ‘s winter season (at home)?? Liked the recipe and the description, surely will give it a try. Nice dahi …thanks wants more recipe. The curd just refuses to set. The milk was just about lukewarm when I added it to the earthen pot with curd. Also the first batch that I tried, the milk curdled after I poured the caremelized sugar. Why did that happen? If the milk curdled, that means the milk or sugar is too warm. Also the yogurt culture must be room temperature. If it is in fridge, take it out for sometime. How do I get the reddish color? Once you caramelize the sugar and mix it with the milk you’ll get the reddish color. Hi i tried ur recipe but it didn work for me. which curd u hv used? khatta or meetha. Hi i am thinking of making mishti doi as i love cooking planned to do today night so that it can set overnight but mom is not allowing, so will try tomorrow morning. Please clarify after how many minutes of removing from flame should i add curd, and whether to let it stay for 9-10 hrs in fridge or room temp, also i have earthen cooking kadai can i use that instead of normal iron kadai. 3) never set curd in an iron vessel. It will rust, spoil the curd, and also prove messy for your health. Best is to use an earthen pot, or even a steel vessel is good. Thank you for the recipe. I followed your recipe to the T and the results were fabulous. Giving in to my temptation of trying something different, I tried this using jaggery in place of sugar and it turned out equally good. Also using mango and strawberry flavors the third time. I know the purists would probably breathe fire at this, but ita amazing how a stable basic recipe can work wonders for an experimentalist like me. Thank you once again and keep up thw good work. Cheers! I have tried your mishti doi receipe. The good thing is that taste wise it turns out to be perfect. But inspite of trying various methods to set, it doesn’t work. I have even tried to alter the proportion of curd and also leaving it to set for about 24 hours. You should check the temperature of the milk, if its too hot the curd wont set. Made this just now, exactly as per the reipe (modified a little by adding some cocoa for extra browning). Kept it to set. Only problem – I can’t wait to try it – it’d be another 12 hours or so before it sets and cools in the fridge. I have had Mishti doi just once or twice in Delhi and I loved it. Never got a chance to try it at home.Your recipe looks so tempting that I feel like trying it out right away. Just have one question. I do not have full cream milk at home. Will it come out good with 2% milk? You can definitely try with 2% milk, but I’m not sure if it will set properly. Let me know how it goes. I tried your recipe with 2% milk and the taste was good. Just that it was not as thick as yours, which I had already expected. Also I made it like regular yogurt and did not boil the milk to half. I will try it again with full cream milk and follow your directions as per your recipe.Wish me luck and thanks a lot again for sharing this wonderful recipe. HI !! DO U KNOW THE RECEIPE FOR GUD RASOGOLLA. I SEARCHED THE NET BUT COULDNT FIND IT. PLZ PLZ UPLOAD ONE IF U HAVE IT. AND BTW THANKS FOR THE MISHTI DOI RECEIPE. Your recipe is the most authentic of all that I have looked over in the net. I should be trying it soon. Thanks a lot for the comment. Do let us know how it turned out. Thanks Sudeshna !!! I tried it and it really came out good . I am a bengali with a sweet tooth (surprised?? ), married to a UP-ite who is as crazy about Bengali food as me or probably more. Mishti Doi is one of my all time fav’s and whenever I visit Kol, Baba makes sure I get plenty of it. With a little penchant for cooking, I will definitely try the recipe and surprise my better half. Hopefully it will be a pleasant surprise ! Does this work with Splenda? Someone in the family is diabetic but cannot resist Mishti Doi as described in your post and the comments. I’m not sure about Splenda. But, I think it should work out :). I have enjoyed all the conversation on this topic of mishti doi. I have savoured this delicacy in Kolkata and many towns in West Bengal. I wanted to try making it at home. I however didn’t have the time and patience to boil down the milk to condense and reduce its bulk and then add sugar, etc., etc. So I bought some ‘basundi’ from the local dairy farms, heated it, added doi (the freshest and least sour doi is the best) and sugar to it and let it set in a warm place for 4-5 hours. Voila ! Mishti doi. This way you save on gas and time, letting those bhaiyyas do the dirty work of boiling and condensing. Try it and let me know…. I never tried Bengali cuisine. I came across your site while looking for interesting recipes. Well, your site sure offers them. Everything is beautifully displayed. I am going to attempt some of recipes you published. I tried Misti Doi for the first time last weekend. I reduced the milk, then added the gur, but the whole thing curdled. It still tasted good, but is this supposed to happen? I think its probably because of the gur that you have used. Try it once with sugar instead of gur. Add the sugar just before you take out the milk from flame. Kay, you need to mix the gur after taking the reduced milk off the fire. Allow the milk to cool slightly before you mix. hi sudeshna good to find yr blog as being in kolkata i am a marathi married a bong so easier for me to follow yr recipe and make and i am confused 1.should i set the curd with khatta dahi. You can use sour curd for it and the other steps as mentioned. No need to smear the pot with curd, as pour the lukewarm milk over the curd. And do not disturb the pot until set. Hope this helps. I had made this and it turned out awesome. thanks for the recipe. I would just like to know that i wud like to make this with jaggery. wht wud be the quantity. Thank you for the comment Sunita. If you are making it with jaggery, I would suggest you add the a little less jaggery than you have added sugar. Oh my god! My husband has spend a better part of his life in Kolkata and he can’t stop talking about food up there. And he has a horrible sweet tooth. Recently I made yogurt in earthen pot where he mentioned about Mishti doi and how he loves it. I’m so glad I found your blog. Hello, I am from Bangalore but married to bengali and I tried this recipe and it takes very long time for the yoghurt to set in cold countries, mine almost took 24hrs to set. Also for mishti doi, using more yoghrt for setting (more than the normal quantity used for regular curd setting), is must. And one more correction, normal yoghurt doest set in metallic utensil. My regular yoghurt never goes bad, but I always have problem with Mishti doi…maybe sugar is the culprit…. but thanks for the recipe Ms Baneerjee. Pingback: …But why yogurt? « Yogurl: A Dairy Diary. Tried the recipe steps exactly 3 times but every time the milk dosent curdle.What may be wrong? .-= Ex´s last blog ..Chandra_Kala =-. This is probably because you have used very little curd for setting. Do add a little more and check. Never disturb the curd while its setting, and in winter its better if you put it in an oven. Just heat the oven for around 10mins and keep the curd bowl inside the oven. Use a glass bowl or clay bowl. Curd don’t set in metallic vessels. I hope this helps. Please do let me know if you need any help. I have always set my curd in metallic containers (stainless steel at home and aluminium degchis)and I always get a perfect result. Also, I have not faced any difficulties even after I stir the milk after adding the curd to the warm milk. The problem occurs due to insufficient quantity of the bacteria in the milk, improper fermentation temperature, or the addition of the bacteria to milk at high temperature.There is one point to be noted and that is, during the fermentation process do not disturb the utensil. Hi Sudeshna, Thank you for this wonderful recipe. It looks amazing. I have been craving bengali doi the last few days and unfortunately it is not available where I am in California. I have a question about cooking the milk. How long does it usually take for the milk to reduce to less than half the volume? .-= msmeanie´s last blog ..New York Times CCC Again! =-. To tell you the truth, I have never looked at the duration it takes to make the volume half. It mainly depends on the type of milk you are using. For full cream milk, on low flame it will take more than 25mins. 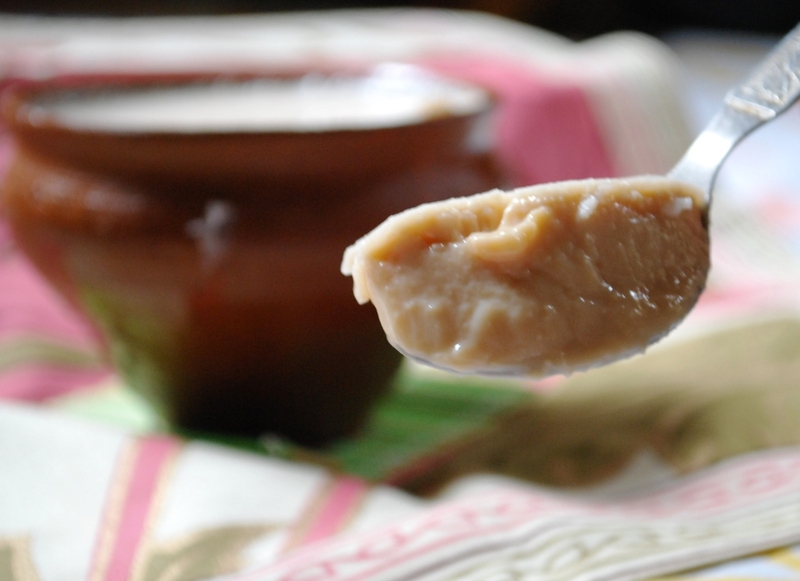 I live in North America and here is a version that tries to aspire to be Mishti Doi….actually, it is pretty tasty and is a favorite at Indian potlcuks. I usually stick to one container of condensed milk, but you can add more according to your sweet tooth. I usually use low fat varities of all the ingredients. Mix them up and bake in an oven till set @ 400 for 2 hours or so. Hi, I followed your recipe very precisely but the curd did not set properly. It was very watery. Where do you think I could have gone wrong? When I add the tablespoon of curd to the milk should I mix it or just leave it as it is? There is no need to stir the curd to the milk. It will set like that itself. I don’t know whether you have disturbed the bowl while it was setting, please don’t disturb the bowl any how while the curd is being set. Also, in winter there is a little problem in setting the curd, as the temperature goes down. The best temperature of setting curd is at 37 degree Celsius. You can preheat the oven at 150 degree Farenheit, switch off the oven and keep the curd bowl in there for 8 hours. Thanks. Shall try it this weekend. I tried this recipe twice without success. Now I know the reason why. To set the doi I had been using curd from the supermarket which did not have active bacteria. Most of the brands in the supermarket here do not have active culture. Just wanted to let you know that I (finally!) did a round-up for Got Milk? I cannot wait to try this. Maybe today!! .-= Kathy Gori´s last blog ..It’s Not Your Uncle Bens’ Rice! =-. I just made some. It’s in a clay pot on the counter..I will control myself. .-= Kathy Gori´s last blog ..Eat Your Lawn! =-. i love this dessert, and the best one i’ve had was made with date jaggery. Thanks for visiting my blog. Yeh I think that would be a nice variation for preparing mishti doi, and the color will just come like that without even making use of the caramelized sugar. Thanks for the idea. I’ll try it the next time I prepare doi. Will be here often and I am glad that your responded to my mail. .-= Nithya´s last blog ..My Interview and Khaman Dhokla 🙂 =-. Thank you so much for visiting :). Please do let me know how it turned up, and if you make any changes please do include that too, I would just love to customize the recipe. .-= Indrani´s last blog ..Bengali Sweet & Sour Pineapple Chutney =-. Thanks for dropping by. Ofcourse, I’ll send you some recipes for the event. Fish is my favorite :). Love this recipe, will have to try it out even though it takes a long time to make. Thanks for your lovely entry to Got Milk? .-= linda´s last blog ..Ginger and orange semolina pudding with blood orange sauce =-. Thanks to you for dropping by my site. The event is a really good and one, and I felt happy being able to be a part of it. .-= rahin´s last blog ..Simplest Mutton Fry =-.